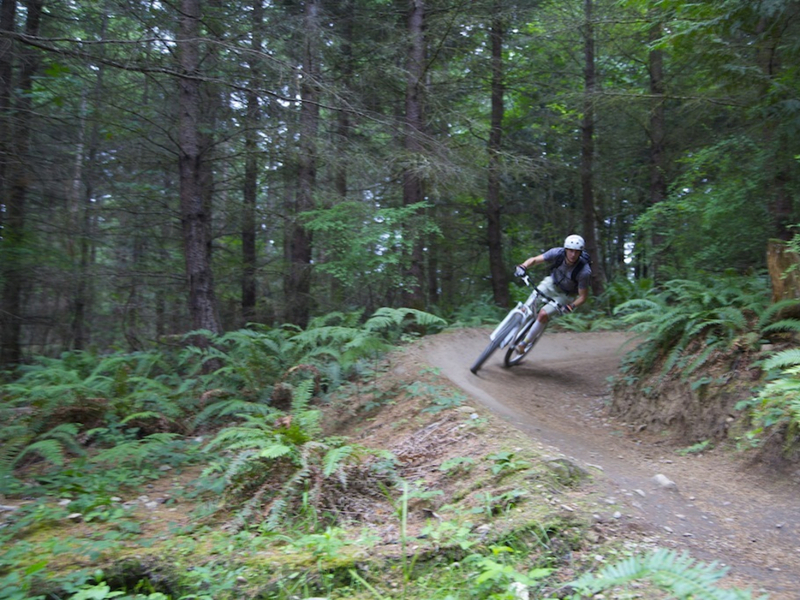 Galbraith is known world-wide for its mountain biking, and the north side is a mix of the best cross country and free ride mountain biking you can find. You've probably heard of Galbraith. Seen it in magazines. Seen it in professional edits. Heard anyone who rides in the Northwest talk about it. But none of that equates to actually riding Galbraith. The mountain we love so much has upwards of 100 different trails and service roads, and that number seems to grow every season. So we split Galbraith in half, a North and South side, to differentiate between the two types of riding found on each side of the mountain. 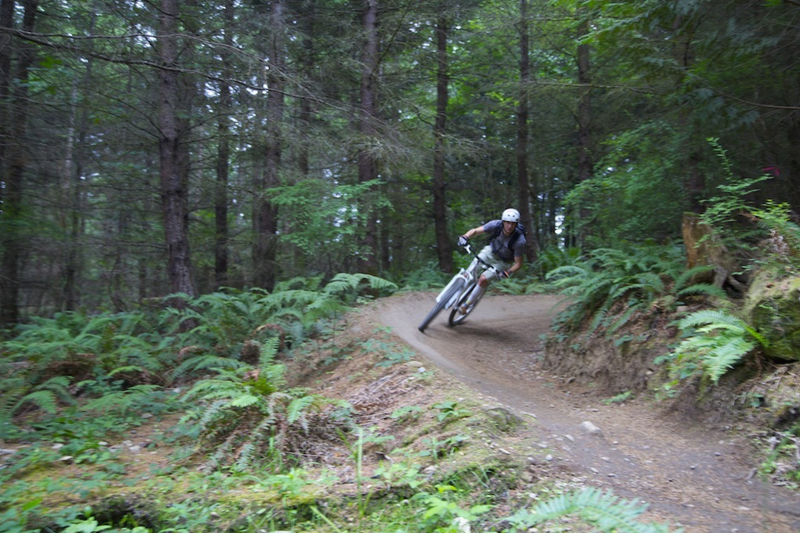 The North side of Galbraith is classic cross-country mountain biking... with the modern throttle of downhill runs thrown in occasionally. Galbraith, as a whole, is either service road or single-track. 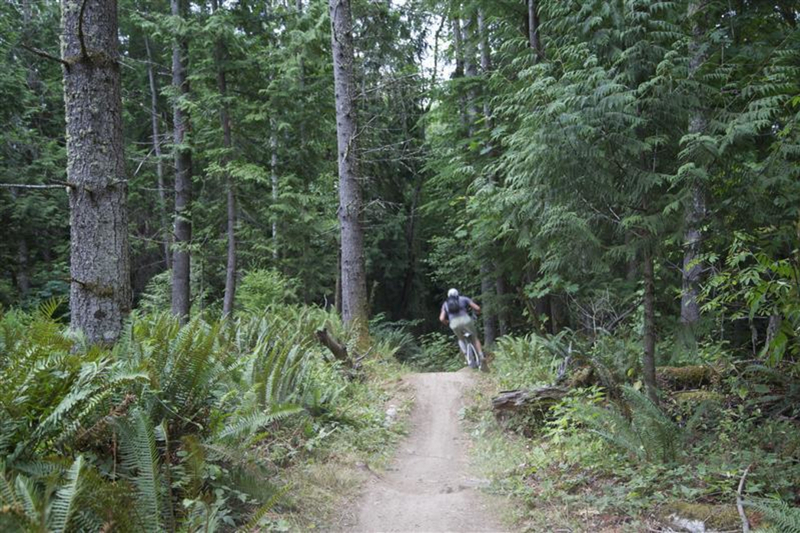 The North side of Galbraith has more single-tracks that aren't one-way, and you are able to climb up them instead of resorting to taking the service roads. 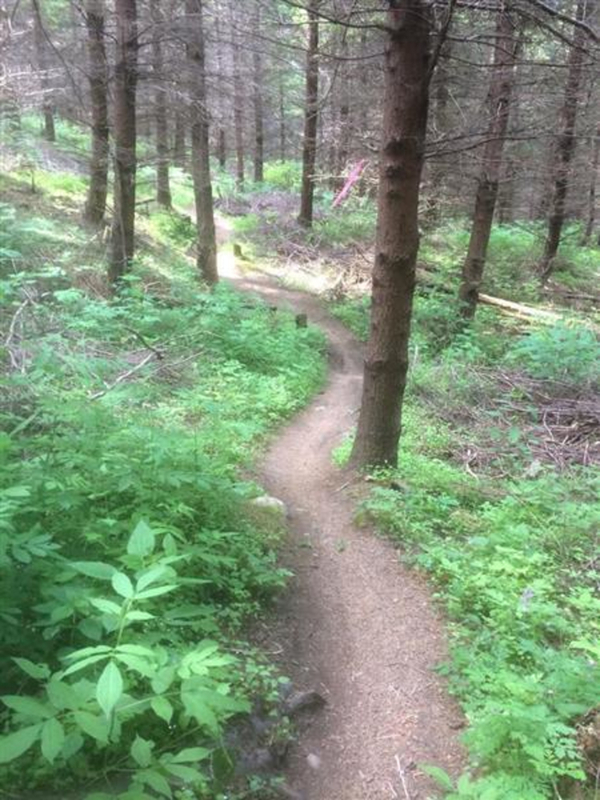 This all-mountain feel to the North side has established it as the part of Galbraith flocked to by bikers who are looking to climb up, then shred down. 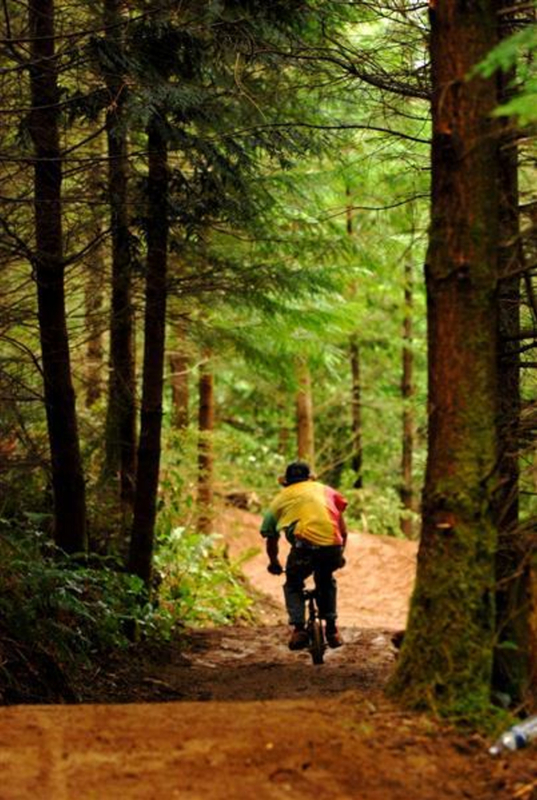 There are so many trails that we can't think of naming half of them, but we'll do our best with our recommendations. The entry way for the North side is at the Birch Street Trailhead. From there, head up the Ridge Trail. The switchbacks are a good warmup for the legs, and while technical, not too difficult; doable for all levels. Stop at the rock face viewpoint, and you'll see a binocular box: either on the way up, or way down, be sure to stop here and enjoy the view of Bellingham and everything beyond. From the Ridge Trail, you'll arrive at Kiosk / Emergency Checkpoint. 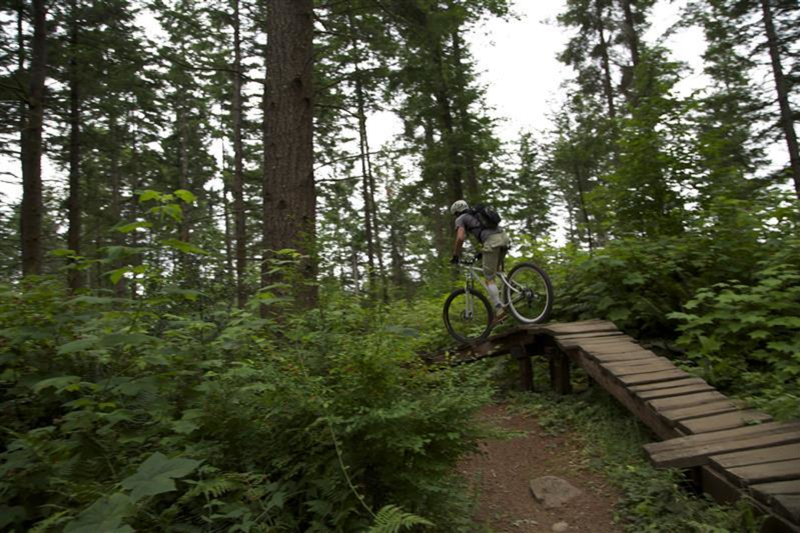 Take Cedardust: the single-track is easy, a relatively rolling-ish flat section with a couple easy ladder bridges and fun features. It will deposit you on a service road named The Wall, also signed as Rd 2400. Take The Wall to Rd 2000 - head left (up) and traverse on this until you reach the Golden Spike trail. 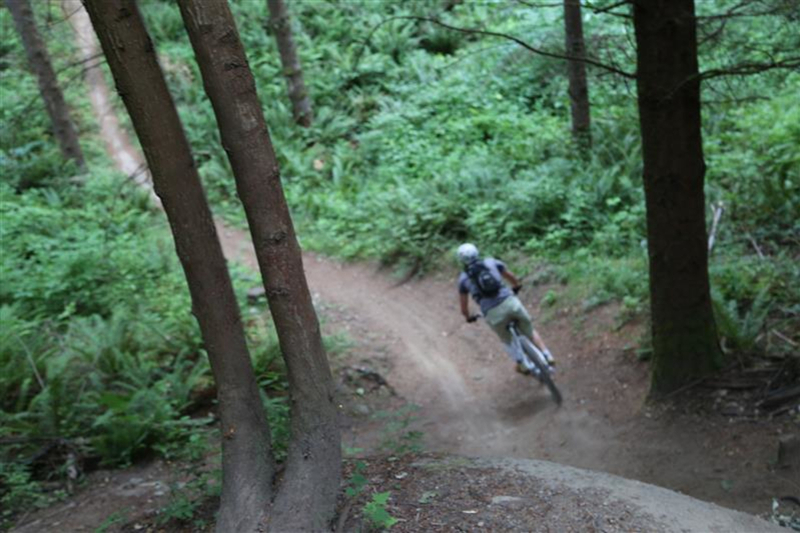 This will bring you to the most popular downhill on the North side: SST. 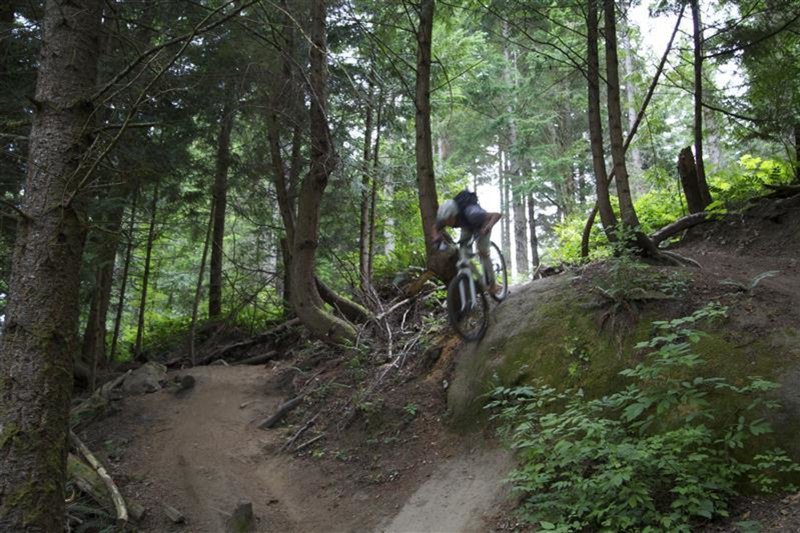 This single-track is fast. Always be prepared and anticipating jumps and features (always by choice). 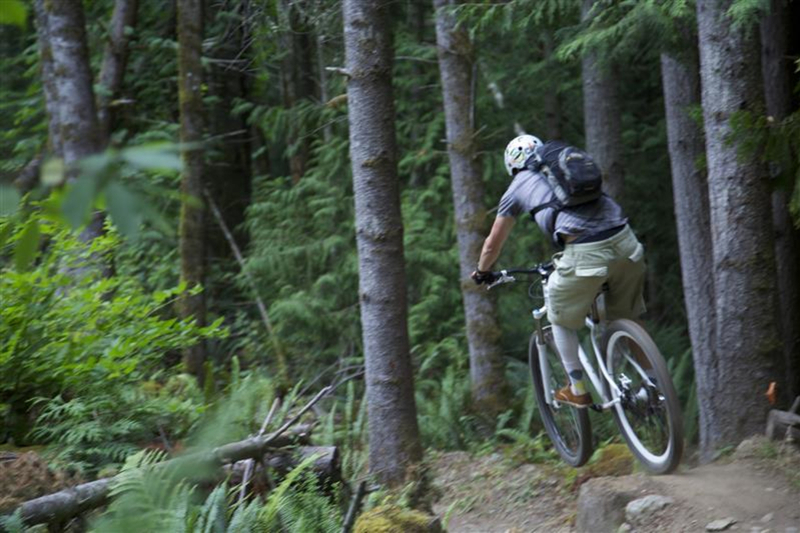 This is a great introduction to the flowy, technical downhill riding seen on the South side. 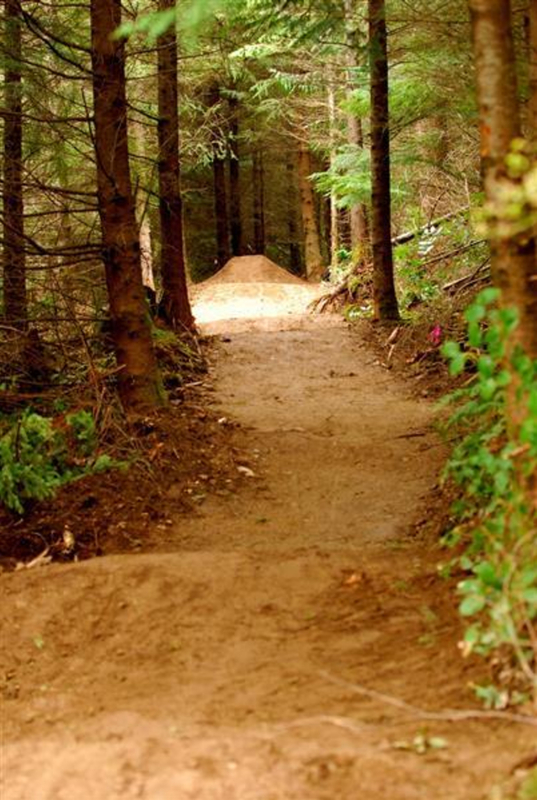 SST will take you back to the Ridge Trail, then back to the parking lot. All and all, this specific loop can take about 1.5 - 2.5 hours. But that is just one loop.....there are so many. 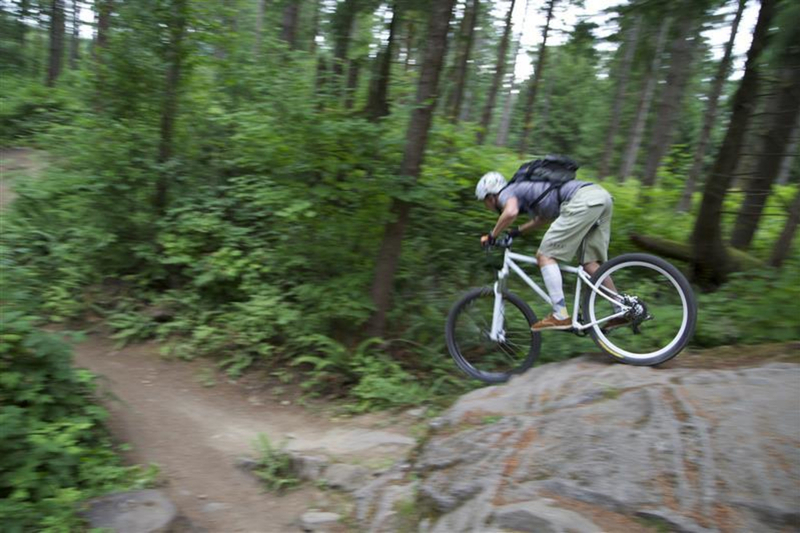 The North side is great for all riders, and has something for someone of any level. From Bellingham, cross east under I-5 on Lakeway Drive. Continue on Lakeway Drive for about 5 minutes - you'll see Birch Street on your right at a stoplight. Head up to the top of this street, and there'll be a small parking lot. There is some overflow parking along the street on the way up, and if all is packed, you can park in the Whatcom Falls Park across the intersection from Birth Street. 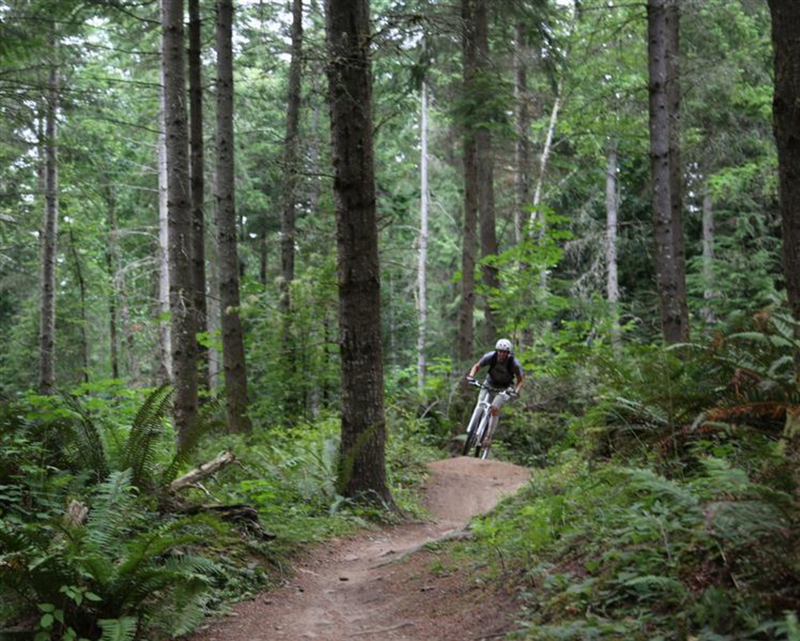 Maps can be purchased at local bike shops (Fanatik, Kulshan) and REI, as well as running stores (Klicks) in Bellingham. They are 14 bucks, but incredibly detailed and accurate, and printed on waterproof paper, so they are safe to ride/run with.